In my last post, I described the simplicity that SignalR brings to table when we want to include real time asynchronous communication between server and client(s) in our application. In this post I will make a simple application, the proverbial ‘Hello World’ kind of application to introduce the basic concepts of this new library. 1. 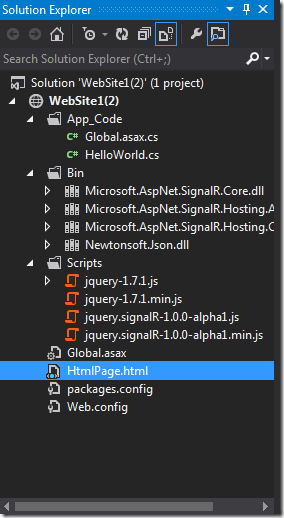 Fire up your Visual Studio and make a new empty ASP.NET Web forms web site. a) App_Code folder – which will house our hub class and the App_Start folder which contains the RegisterHubs.cs file, housing the code that maps the hubs available at application startup. c) Bin folder housing all the necessary assemblies that co-ordinate things on the server side. This also contains the JSON serializer Json.NET. d) packages.config which lists all the external dependencies. Now we will have to change this setup a little bit in order to make it work in a web forms website. 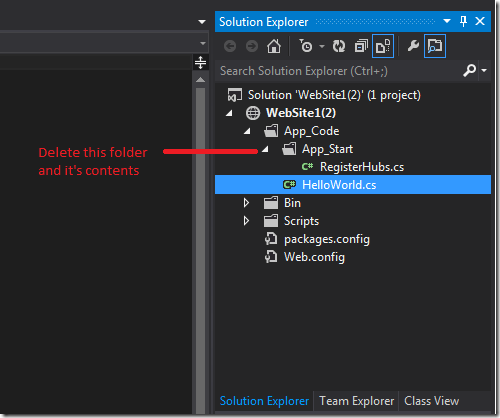 Remove the App_Start folder and the containing RegisterHubs.cs file from it. The App_Start folder is something that the MVC website can use to execute code at application startup. Web form website uses Global.asax to do just the same. I believe this a template error, and will be corrected out in future releases. Note that we are required to include System.Web.Routing and Microsoft.Aspnet.SignalR namespaces and make the Global class inherit from System.Web.HttpApplication class.The purpose of having RouteTable.Routes.MapHubs is to map the hubs available to the client to a special default address: /signalr/hubs. If you want to configure the availability of hubs to a special address then you will have to provide custom address in the MapHubs as a string parameter. e.g. RouteTable.Routes.MapHubs(“~/signalr2”). The main thing to notice here is the inclusion of the namespace Microsoft.Aspnet.SignalR.Hubs and derivation of the hub class HelloWorld from parent class Hub. From the perspective of the client and server model, this is the class that aptly serves as a hub and will receive all the communication from the client(s) and further the same to other client(s) or take some action on the server side. In code, we are declaring that there is a server side method called “Hello” which when executed will execute a method called “hello”, available to all the clients. 5. Now add an HTML page and add the following code in it. 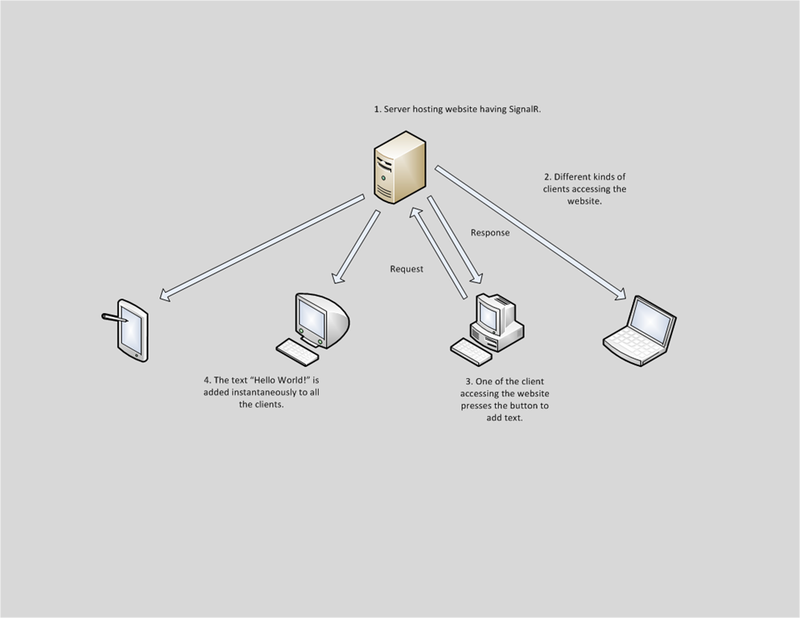 //defining hub which will have client and server side methods defined. //defining what the client side "hello" method should do when called. //by the server side code. //called when a certain client side event occur. In the end the code hierarchy should look like in the following image with all the code in the right place. 6. As the last step start debug and run the website in IIS Express. Open the website in multiple different browsers and press the “Say Hello” button. It will add text “Hello World!” in all the browsers simultaneously in real time. 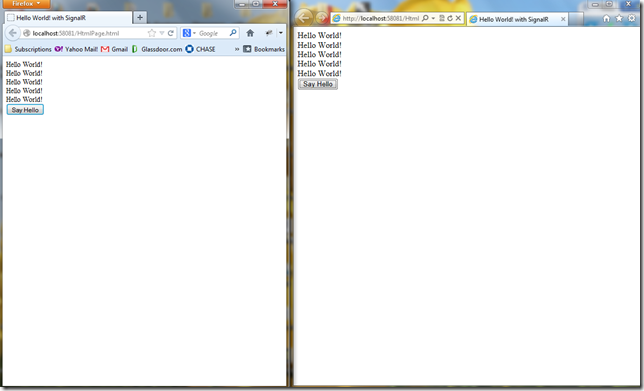 Website running in IE9 and Firefox, receiving instructions from server in real time. The code example presented here has been deliberately kept simple to prime the reader of the basic concepts of this new library. 1. 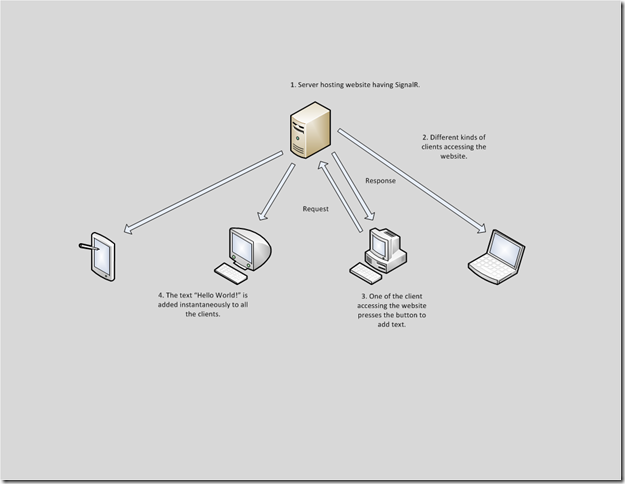 Real time communication between server and client(s). 2. Auto negotiation of protocol (WebSocket, forever frames, long polling etc.) between the client(s) and server. 3. 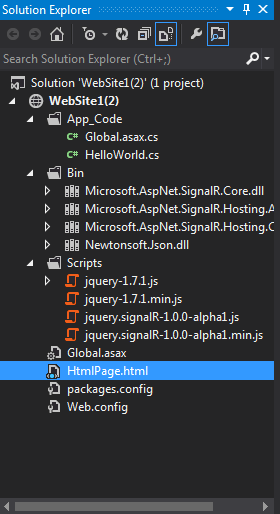 Simple, unified programming interface built upon C# (server side) and jQuery (client side in ASP.NET). In the next post I will demonstrate a more involved example, utilizing jQuery UI. Stay Tuned.